The technology helps to bring the ink to life in a unique display of form, surface, and texture. A visual artist named Alison Bennett has used augmented reality in a unique new way as she used the technology in combination with iPads to turn people’s existing tattoos into three dimensional artwork that appears to come to life in front of the viewer’s eyes. The exhibit Bennett created is called “Shifting Skin” and was on display at a gallery near Melbourne, Australia. The tattoos that were used for the augmented reality art had already been created and were not designed specifically for use in this artwork. Instead, Bennett found ink that she liked and decided to use the technology to provide a unique type of examination of surface and texture in order to produce a three dimensional experience that had never been created before. 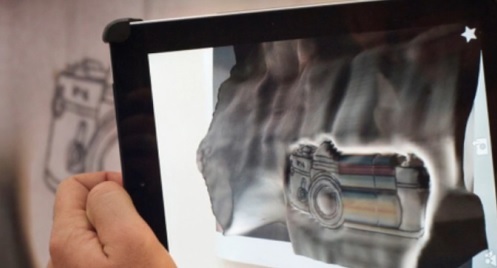 The augmented reality technology turned a flat image into a moving, three dimensional experience. To do this, the images of the tattoos and their surrounding skin were taken using a flatbed scanner. Bennett then ran the tattoo images through her augmented reality program. The result was an adventurous one that enhanced the effect of the existing image and added to it with additional graphics and animations. When the augmented reality tattoos were viewed through a tablet, it turned the two dimensional image into one that appeared to “come to life” and float in a three dimensional way within the space of the real environment of the gallery. When seen through the device screen, it looked as though the person’s skin in the background of the tattoo turned into a type of topographical map of different surfaces, depths, and tones. The reason was that the artist ran the scanned images through an algorithm that focused on texture and tone and rendered them in this unique new visual way. The augmented reality overlays were then added, powered by Aurasma, which turned the tattoos into three dimensional body art structures. The augmented reality exhibit was displayed near Melbourne, Australia, at the Deakin University Art Gallery. It has since drawn a considerable amount of interest as well as the eye of the world as it applied this cutting edge technology in a way that has never before been seen.